Jason Goucher and Samanatha Robinson, of Niche Inc., are pulling out all the stops with an afternoon of live music on Water Street. 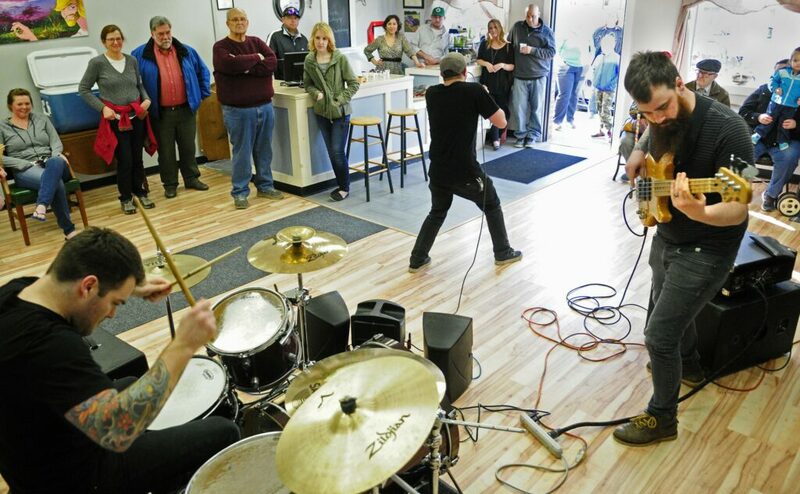 GARDINER — With the hours until the start of Record Store Day ticking away, Jason Goucher spent part of Thursday afternoon in his shop, attending near-last-minute details for Gardiner’s annual Music Walk. Now in its fourth year, the Music Walk event — scheduled for Saturday — brings live tunes to the city’s historic downtown, giving music fans something extra to celebrate on Record Store Day. Along with his partner Samantha Robinson, Goucher owns and operates Niche Inc., an independent record store and gift shop at 307 Water St.
With three years of Music Walk planning experience behind him, Goucher said the event is now both easier and harder to plan. The Music Walk is organized along the lines of an art walk, with musicians performing in downtown businesses in the afternoon and evening. 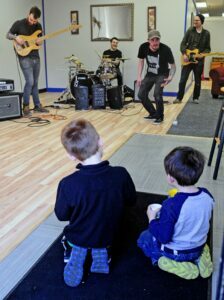 In all, 25 acts mostly from around Maine are scheduled, and they are all playing for tips. That’s enough bands to allow some host locations to feature two performances, he said. He tried to accommodate the acts who have appeared before and wanted to return, as well as bands that want to perform there for the first time. This year the footprint is smaller, with most acts performing at locations between Bridge Street and Maine Avenue. The exception is the Life Community Church on Church Street, which is hosting a band and will serve as the rain location for the drum circle. Music Walk events start at 2 p.m., with a drum circle in Dearborn Park. Papa’s Roadhouse Food Truck arrives around then as well. Face painting by Isabelle Files starts at 2:30 p.m., in the park, and the musical acts get underway at 3 p.m. The Music Walk’s main event, a performance by Ethan Ayden and the band Sassquatch, is scheduled to start at 6 p.m., on the stage in Niche Inc., wrapping up about 7:30 p.m. But that’s not the end of Saturday’s music in Gardiner. Livingston Taylor, part of the musical family that includes brother James, is appearing at 7:30 p.m. at Johnson Hall, the city’s historic opera house. Michael Miclon, the executive artistic director at Johnson Hall, said the performance schedule for the year already had been set, and it just so happened that Taylor’s performance, which is sold out, coincided with Record Store Day and the Music Walk. The inspiration for the event was Record Store Day, which celebrates independent record stores and the people who work in them. When Goucher and Robinson first applied to become an official Record Store Day record store in 2016, they wanted to do something more. At that point, Niche had been open about six months.